Meet and Greet on arrival in Delhi (India) and transfer to the Hotel. Afternoon or early evening tour activities can be done if your flight arrives early today. Overnight stay at Hotel. Morning after breakfast at your hotel, your trip begins with New Delhi visiting Birla temple, Jama Masjid (mosque) India’s largest mosque, Rajghat the place where Gandhi was cremated, Gandhi’ museum. Drive past through India Gate, Indian Parliament, President House and other Government buildings. Later drive to Agra, on arrival check-in at Hotel. Overnight stay at Hotel. Morning after breakfast drive to Jaipur en route visiting Fatehpur Sikri built to commemorate the birth of Akbar's son. The complex was completed in 1574, but 14 years later the city was abandoned. 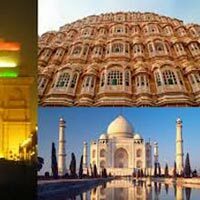 Of particular interest are the Red stone mosques, courtyards and the palace where Akbar played chess using slave girls as pawns, continue your drive to Jaipur, on arrival check-in at Hotel. Overnight stay at hotel. Morning visit Amer Palace fort , en route stop for photography at Jal Mahal (Water Palace), and Hawa Mahal (Wind Palace), you may enjoy an elephant ride to the glorious hilltop fortress like Maharaja, After visiting Amer Palace trip of City Palace, the Observatory (Jantar Mantar), the Hawa Mahal (Wind Palace). 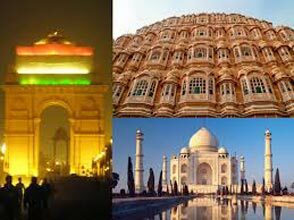 After Jaipur trip, drive straight to Delhi, for your flight back to home/ or your own arranged hotel in Delhi. Hotel can be arranged in Delhi today at extra cost on request.